Butte, MT, January 19, 2017– Headframe Spirits is proud to announce it is now a Certified B Corporation®. We will be joining global innovators in a movement to use business as a force for good. Creating a corporation that values its employees, elevates social, environmental performance, and gives back to the community, which was already a passion for John and Courtney when they first started Headframe Spirits in 2010. 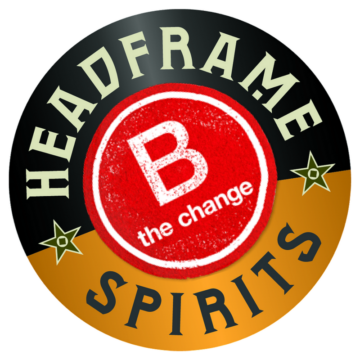 Headframe Spirits will be recognized Thursday, January 19th in Missoula as one of four organizations in Montana to be a Certified B Corporation®. A panel will discuss the principles behind becoming a Certified B Corporation® and how they can improve the business climate by using business as an agent for change, purveying positive values, and ultimately transforming the definition of success from being the best in the world to being the best for the world. We hope to inspire the business community to join our efforts to redefine corporate practices and elevate business life in Montana. Owners, John and Courtney McKee began their journey with this company in 2010, opening their tasting room doors in 2012. Since then, they have not only won awards and accolades for their products, but also for their impact to their community and state. In 2014 Governor Bullock recognized John and Courtney as Entrepreneurs of the Year and in 2015 as Ambassadors of the Year by the Montana Office of Tourism. Recently, they were award 2016 Small Business Champions of the Year by the Small Business Administration. Certified B Corporations meet the highest standards of overall social and environmental performance, legally expand their corporate responsibilities to include consideration of stakeholder interests, and build collective voice through the power of the unifying B Corporation brand. There are more than 1,200 Certified B Corporations from over 120 industries and nearly 50 countries with 1 unifying goal – to redefine success in business. Headframe Spirits ~ Every drop is made with respect.